Sitiawan Cendol, Nasi Ayam Mama @ Seri Manjung & I Discovered Teluk Batik !!! Realize it’s been some time since I’ve posted anything from the outskirts of Ipoh, as well as outings to other towns in Perak. Since Chinese New Year in fact, and the Hanoi trip, my momentum was somewhat lost. Crawling out of bed and going to work sounds tedious and spells boredom on most days, while driving to obscure destinations for work does not seem as tempting like those good old days anymore …. Where’s the Zest in my Life ?!!! MMMM …. yummy condiments from the roadside for that extra ‘kick’ !!! Sitiawan’s very own, Kampuan (sp?) Noodles ….. dry or wet, with curry, wantan (dumplings), pork ribs, fishball, etc. The choice is yours. But the compulsory dash of Kampung Koh’s Garlic Chilli sauce is inevitable. This journey takes precedence over my Hanoi posts, for a simple but obvious reason. To squeeze dry my brain juices in order to recollect the Halong Bay journey may take a lifetime, given the fact that I’m rather drained for the time being. Soon, OK? Last week, work took us to Sitiawan, and Seri Manjung, both towns next to each other, located at the western coast of Perak. If you’ve been to Lumut (where the jetty’s at before departing to Pulau Pangkor), you would’ve passed by these towns somehow, unknowingly. The Lumut Highway is a wonderful path to discover smaller and some off-the-(tourists)-track destinations in Perak. From Parit, Pusing and Tronoh, to Seri Iskandar, Beruas, Pantai Remis, and of course, Ayer Tawar, Sitiawan and Seri Manjung. The highway (wonder if that’s what it’s called, officially) does NOT collect toll fees, fret not. And with two lanes on each side, with 90km speed limit, and 60km at certain areas. This corner shop at the Kampung Koh crossroad traffic lights attracted our attention, while we were busy searching high and low for breakfast. The place was packed with locals and out-of-towners alike (it’s rather easy to spot them, as we’re considered outsiders here as well!). The famous Loh Mee in Kampung Koh is supposedly located near to the wet market, but we had no idea where the market is. And after countless rounds in Seri Manjung in search of a proper breakfast joint, we instinctively jumped at the opportunity of joining the crowd that morning. You can point to what others are having, in case you’re at lost on what to order. The Loh Mee was sadly out-of-stock by the time we went, hence we ordered a Dry and a Wet version of their famous homemade noodles. Resembling the texture of Hakka noodles, the springy, flat noodles was thankfully devoid of alkaline taste (from lye water being used), and complemented well by slices of tender pork ribs, and fried shallots. The noodle on itself was rather tasteless, but that’s when the condiments come into play. Kampung Koh’s original chilli sauce (Koki brand) and vinegar with garlic (in a jar) did the job well, lending a sour/spicy note to the noodles and meat. Location : Sin Ek Sek @ Main Road, Kampung Koh, 32000 Sitiawan, Perak. Sorry no MAP, but coming from Sitiawan town towards Kampung Koh, you’ll see this shop on your left, at the traffic lights. JAMES CENDOL – Now helmed by the wife instead ….. So what’s next after breakfast? Thirsty? Suffocating from the sweltering heat? No sweat. 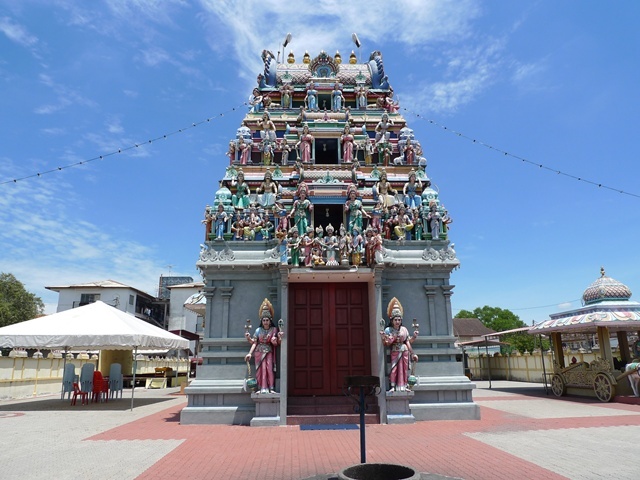 Look for the famous Sitiawan cendol, situated in front of the Indian temple, within walking distance from The Store in Sitiawan on Jalan Lumut. The difference lies in the preparation of the cendol. And the presentation of the proprietor, or rather, the wife of the owner. The owner is seemingly operating at another location, while this original location is being manned by the wife, complete with the signature RED bowtie. Yup, remember the RED bowtie, not BLACK. There’s a flattering imitation a stone’s throw away. As I mentioned, the preparation of a bowl of their famous cendol requires much sweat, though no tears. The classic ice-shaving machine probably has history dating back to my grandfather’s generation, and you can witness her pumping muscles … I mean, vigorously rotating the handle to generate shaved ice bits for the cendol. Not as smooth as those Ais Kacang, but you can bite on those crunchy tiny bits of ice, in addition to the soft strands of Cendol, and large red beans. Though I’m still giving my vote to the Penang Road’s version, James Cendol deserves an honorable mention in my books. Location : James Cendol @ Jalan Lumut, 32000 Sitiawan. In front of the Maha Mariamman Temple, near to The Store. Opens daily from 11.30 am onwards, until the day’s supply finishes, or until about 7pm. Of course, after breakfast, and erm, a simple cendol-refresher, we had to finish our duty for the day, before feeding our lunch cravings. How to burn calories, you asked? Surprisingly, it was my virginal visit to Teluk Batik. Where? Haha … Least I’m not alone. 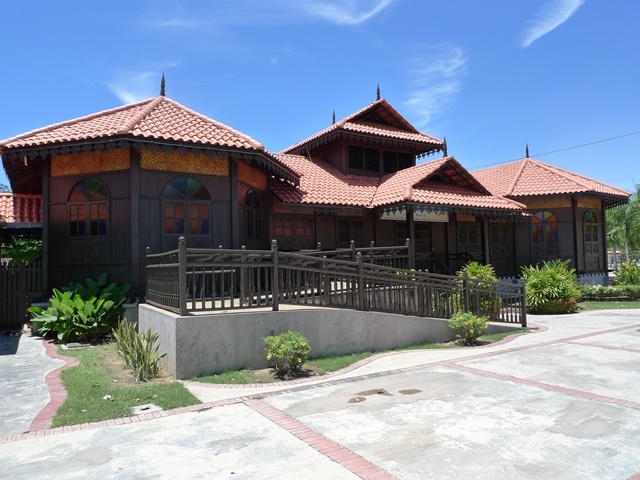 Teluk Batik is a beach getaway on the western coast of Perak, about 5 minutes drive from Lumut, and accessible by car, with ample parking space, and a few resorts for travellers. The beach is lined with various stalls, selling food & beverages, as well as clothes, accessories and souvenirs. 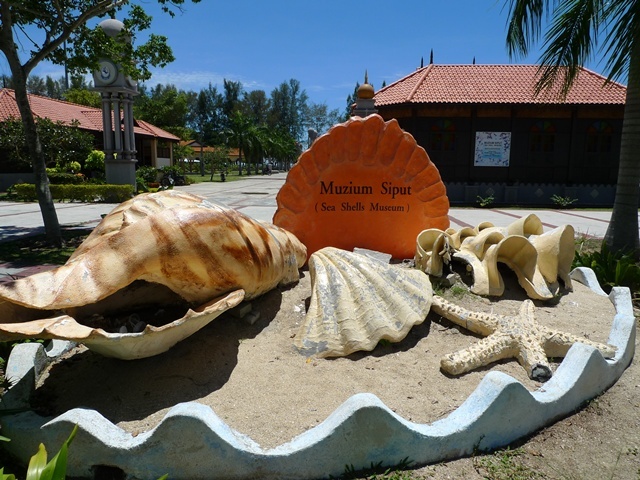 A tourist destination but overshadowed by Pulau Pangkor, indefinitely, Teluk Batik has been attracting a steady stream of tourists (majority the locals, from what I witnessed that afternoon), and even had a facelift of sorts, now with a Waterfront square, just like Lumut. Even a Sea Shells Museum?! The seemingly abandoned museum …. One wonders who admire, erm, sea shells? Obviously, people stare when you’re all decked in shirts and suits, with slacks and leather shoes, all the while prancing and camwhoring by the sea, under the scorching heat. Ahem, but nobody recognizes us ma …so no uneasiness at all. Thick-skinned eh? 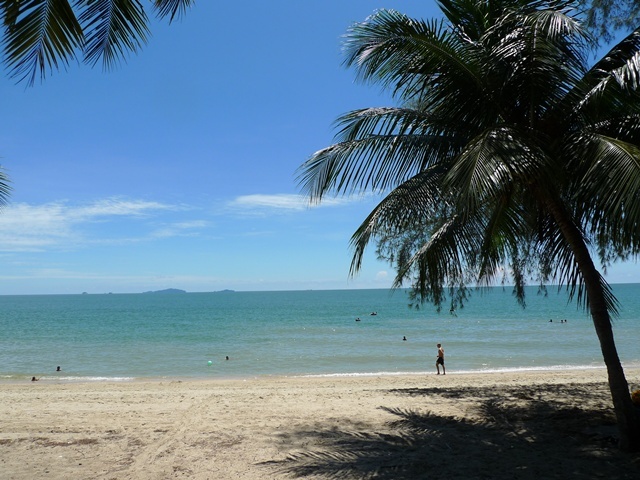 You can visit http://www.malaysiavacationguide.com/telukbatik.html for information on the beach, as well as contacts for various hotels/resorts around the area. Here’s a MAP, so you can have a rough idea where this place is. 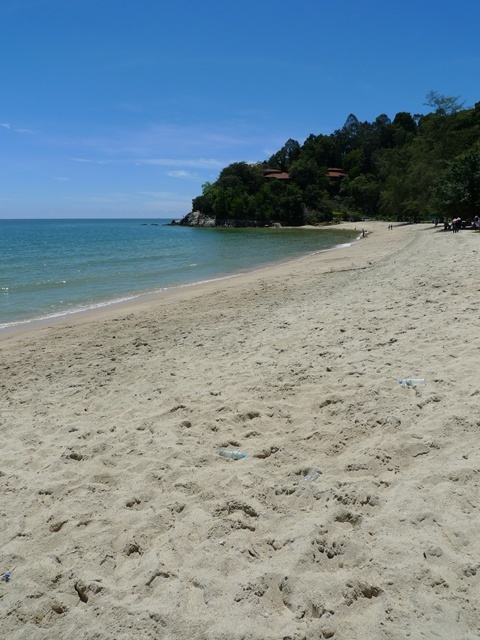 “Teluk” means bay in Malay language, probably stemming from the inward curving bay this beach is located. Though far from pristine waters ….. or golden sands, at least you don’t need to travel far for a simple yet relaxing holidays. No, you’re not seeing double. They’ve ‘expanded’ across the lane! And to cap things off, we went for a late lunch (we DID work, after all) at Nasi Ayam Mama in Seri Manjung. A very, very popular HALAL restaurant in Seri Manjung, you’ll be stumped at the sheer amount of people having lunch here during peak hours. Recommended by Malay colleagues as well as other races, their specialty needs no intepretation. Or you can’t understand what Nasi Ayam means? It means Chicken Rice, in Malay. The Chicken Rice here is GOOD. I seldom throw praises on Malay-style Chicken Rice, as most failed in the chicken department (tough, not tender, salty, or plain tasteless) or the rice department (soggy, too artificially yellow, too hard, or overpowering margarine taste). 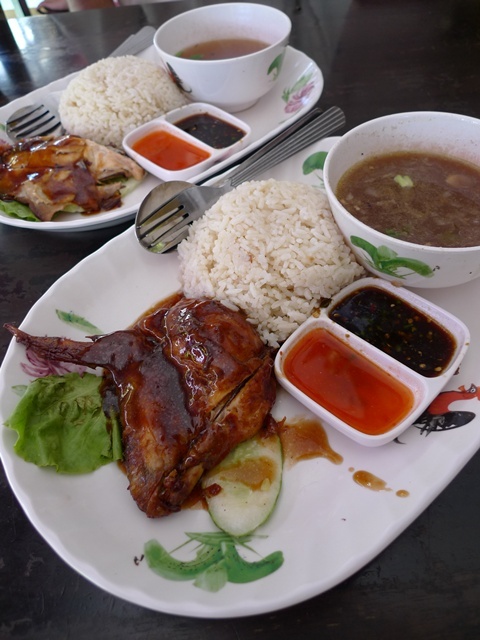 But pleasantly surprised by Nasi Ayam Mama’s quality, the rice being fragrant and fluffy, resembling Hainanese chicken rice, while the roast chicken was flavoursome, with or without the gravy. The dipping sauces were right on as well, the chilli sauce being a little sweetish, and the bird’s eye chillies in thick soy sauce was perfect to perk things up. The soup was a little too peppery for my taste, but Mr Z (my colleague) enjoyed it nonetheless. FYI, they serve other dishes as well, rice and noodles alike. 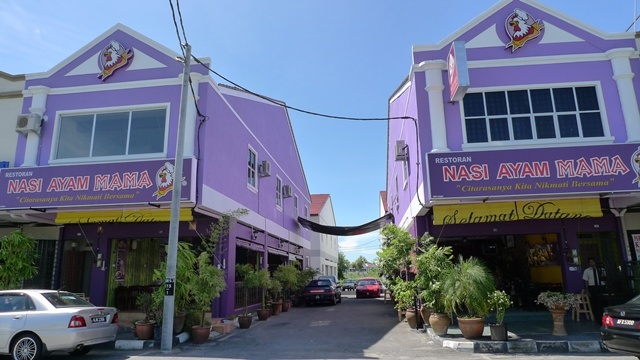 Location : Nasi Ayam Mama @ 63-65, Persiaran Manjung 3/2, Taman Manjung Point Seksyen 3, 32040 Seri Manjung, Perak. With that …. 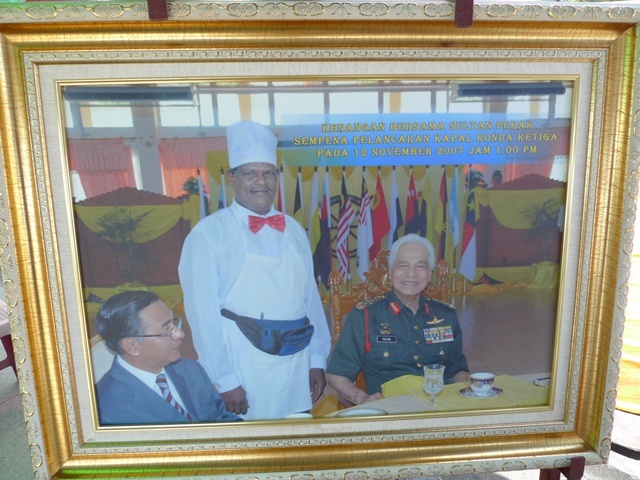 we departed back to Ipoh ; Hunger pangs Satiated, Sleepy yet Satisfied …..
wawawa…. what a logn post…. 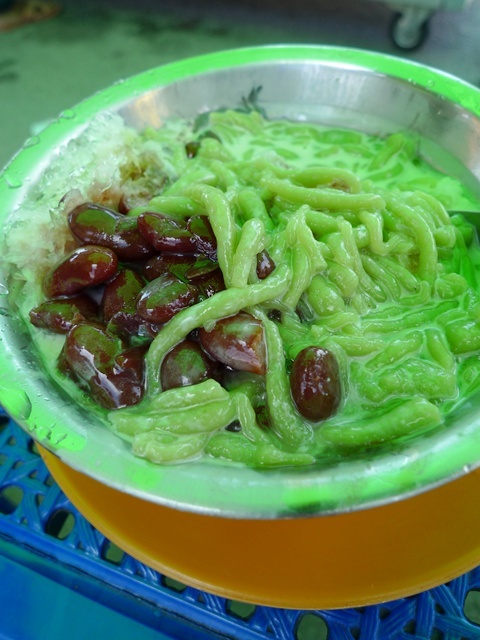 the cendol sooooo keng chao one a………. some more serve for the SUPER VIP… keng chao…..
BSG’s territory! hahaha! yeah.. the cendol rocks! 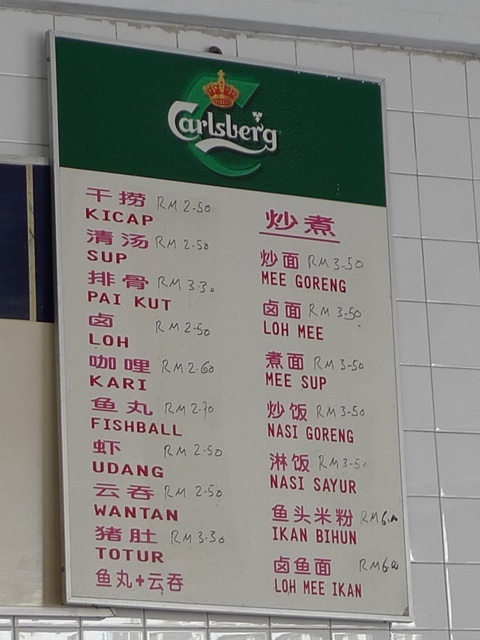 ..but Setiawan is not only about Loh Mee… never go try the Kong Peah ah? Nice pics! Road trip!!!!!!! When!!!???? Thanks. Now I know where to find my fav wanton mee in Sitiawan, and the nice refreshing bowl of cendol. Gotta try on my next visit to Sitiawan ! food hunt at ever corner yeah? ur the indisputable king of Perak food now! Sitiawan is also one of my hunting target. lol My neighbour gave me some of the popular sitiawan “mee sua”. Will find some time go food hunting there. lol Will take note where to have good foods from your posts. U manage to taste all the famous food in Sitiawan within 1 day..haha..finali u got the chance for ur cendol oso..haha! 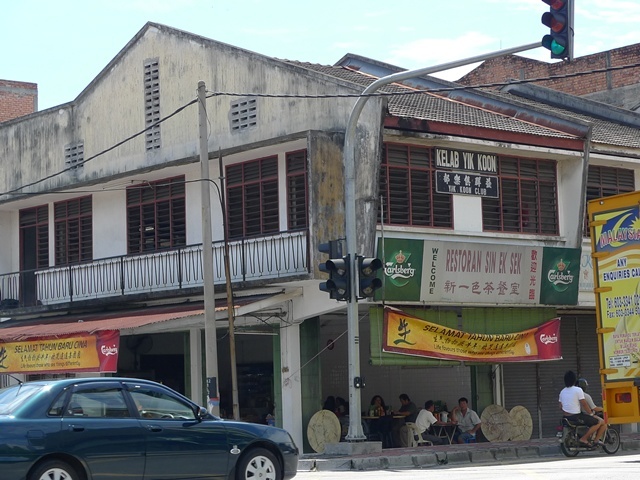 i wanna try the famous cendol, even Agong ate there….must check it out,,,any comparison from the ones we got in IPOH? i like that bow tie…cool.. It is always great to know that your voracious appetite has taken you to the kampungs and da seas ! “do not try to speak Hock Chew before you see BSG”..haha, da team’s da bomb! What a great post! 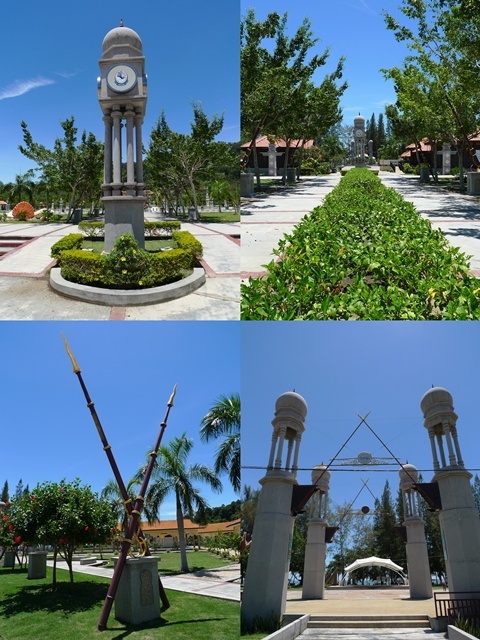 Really nice pics… see more part of Msia! oh, the commuters have started eh? might hop over to ipoh with the kids to visit my bro in law…. so fun! 3 hours? okay wat hor. I like my cendol greenish wrigglies thick, long and soft. Hard to get those in KL. teckiee : Gong Pian at Cheong Cia? 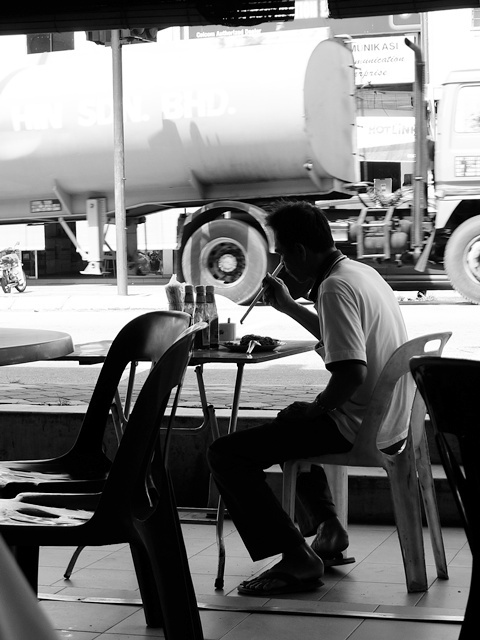 http://j2kfm.blogspot.com/2008/05/sitiawan-revisited.html. is that the one ah? wmw : when? or WHERE? hehe … Selangor? you all can bring me around better, more guides, bringing a lost sheep …. ahlock : yeah pls do. i’m already so late to discover the cendol, as i went on 2 occasions also they chose to tutup gerai one. Food Paradise : red wine mee sua another delicacy. Simple Girl : Ipoh ones I LONG time din eat liao. but cendol being cendol, cant reli differetiate lah … haha. Joe : that’s their signature. though its rather sutffy to dress like that, WITH a bowtie somemore. BSG : gee, that might take me another year or two. hahaha … thanks for the recommedations. i just hop over to u guys’ blog b4 i embark on my journey anyway. haha … sorry, i dunno Hock Chew nor HOkkien. whoops. 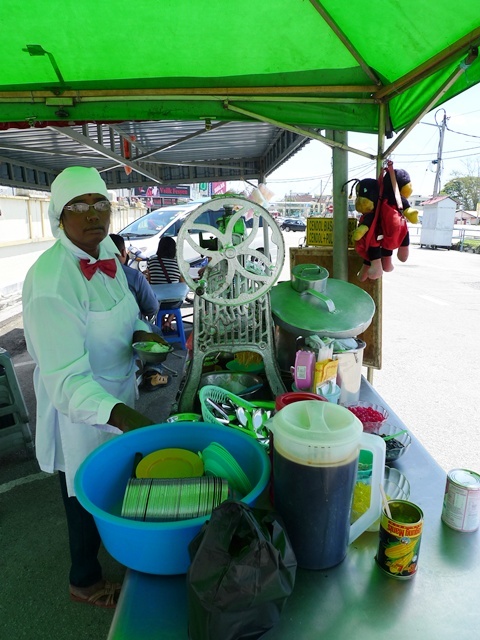 sc : the cendol stall has been around for some time, and it’s a legend of sorts. never heard of? hehe … but maybe cz you’re not Perakian. Nic : today i didnt sit in front of pc in office all day!!! i’m impressed. though i was sitting in front of pc SOMEWHERE else. Selba : Msia has a lot of tourist destinations, begging to be discovered (ahem) … wonder why ppl (ahem ahem) go to the overseas instead of holidaying locally? BangsarBabe : the wantans SOOOOO small lah …hehe, tiny like nothings. no wonder you down 10! Cumi n Ciki : free admittance somemore. Ciki you can tan all you want …. though not too obvious lah … lots of families. iamthewitch : yeah, got pulut one. even Ipoh’s and Taiping’s got pulut liao. but we chose to omit them as they’re rather filling. FBB : yeah! very convenient in fact. and stop by small towns like Kampar, Batu Gajah and Sungkai even. ur Guilin invitation rather tempting lah … how many going as of now? Lingzie : Lumut also got good restaurants few and far. hop over to BSG’s for more …. Sell cendol till wear shirt and bow tie. Respect! Unlike those old school an neh neh wear sarong settle liao …. Wah these are the hidden gems eh? YilingL : previously yes. now not so lah … most Perakians would have known these places. a photo with the lady in red bow tie would be perfect for this post. foodbin : there is. albeit a smaller version. should crop 1st? mimid3vils : now that you mention it … I didnt notice also! whoops. I might be visiting Sitiawan soon and my colleague told me about the cendol. She must have meant this place. 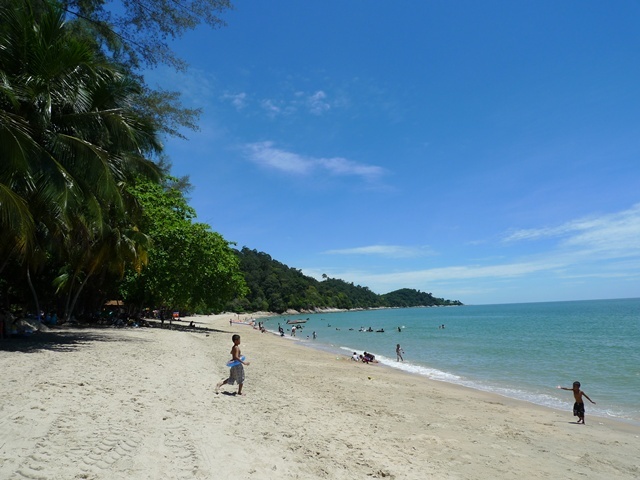 Been to Pangkor ar? Am back…kinda of miss loads of stuff here. Surprise u make a visit to my hometown again. For ur info..the cendol stall is my favourite stall & my parents's crib is simply a walking distance away. Was also surprised The Nasi Ayam Mama was only 1 year old or sort & I have never dine there..will do so. You shd get best kompian at Kpg Koh near the plce u had the lohmee (not my favourite) or someone here mentioned Happy Restaurant is recomended place to enjoy real local hockchew stlye dish. I'm back..after u know lah..the by-E.
eh Hulk! so long never c u lah … by-E? you’re campaigning ah? indie candidate? oh the biscuit shop behind this mee stall? yeah, I noticed many ppl there, but didnt buy any. maybe next time. No lah..just BZ around tats all. BTW..it not the biscuit stall just next to it..its about 1km drive away. Just drive up a little further till trafic light, turn left ..straigth up. there is 2 popular stall that sells famous kompiah (better then the one in S’wan)..one further up onthe left shop..while the other , turn right after market..go slight further up u see the almost corner row of shops. perhaps..I’ll leave u with the contact number. the so call local famous confectionery is a must have. Addictive. will go over real soon. You probably desire a refresher about the useful tips every online company owner should learn about. a sucker and I’m here to see you, Ameriplan isn’t a scam.